Welcome to our Orwellian Protest of the Military Commissions Act. 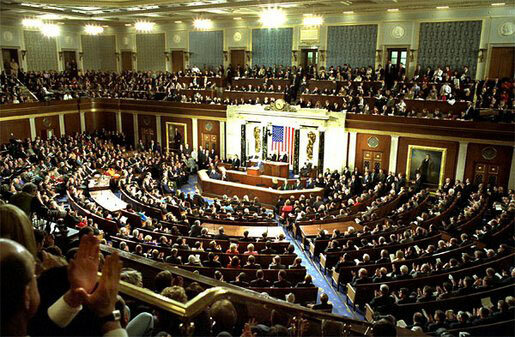 This week, the Senate will hold its first up-or-down vote on restoring habeas corpus. Tell your Senators to support the Specter-Leahy amendment to the Department of Defense Authorization bill. For the last several months, Working Assets members have been leading the fight to restore habeas corpus. We worked hard to ensure that legislation passed the Senate Judiciary committee by holding meetings with key senators. This week, the first up-or-down vote on restoring this critical right will occur in the Senate — and your voice can make a difference. Tell your Senators that it is time to save habeas corpus and restore our Constitution. In September 2006, Congress passed the Military Commissions Act of 2006 (MCA), which stripped the right of habeas corpus for the first time since the Civil War. Habeas corpus is a fundamental right common to all modern legal systems, which requires independent judicial review of charges brought by the executive branch. But the passage of MCA has allowed the Bush administration to hold “detainees” at Guantanamo indefinitely — without any explanation for their imprisonment. Click here to let your Senators know you want to see habeas corpus restored. Indefinite detention is simply unconstitutional, and does not reflect American values. On June 7th, the Senate Judiciary Committee voted to take the first step to restore habeas corpus by approving the “Habeas Corpus Restoration Act of 2007” (S. 185), sponsored by Senators Leahy and Specter. Today, the Senate is starting debate on the Defense Authorization bill, and S. 185 will be offered as an amendment. Without habeas corpus, it’s a very slippery slope towards dictatorship. So click here to ask your Senators to vote yes on the Leahy-Specter habeas amendment; we’ll send a copy of your letter to your representative as well. Please share this message with anyone you know who cares about restoring habeas corpus. Thank you for working to build a better world. We apologize for the lapse in communication…we were very busy preparing for another Hate Week. We have sent all the copies of 1984 in our possession, leaving 166 Inner Party Members yet to be indoctrinated. Following are the House Inner Party Members who have not yet received copies. The Senate Inner Party Members have been re-educated fullwise by now. Pick a rep. to sponsor today! Second Shipment is a Glorious Success! All Inner Party Members of the Senate, persons and unpersons, have now been shipped copies of the Book. New video to be posted as soon as we can edit it. Our mission is 44% complete. We need 174 more copies to re-educate fullwise the Inner Party Members of the House. In honor of President’s Day, we have been preparing another shipment of The Book. This time, we will ship 1984 to every Inner Party Member of the Senator who voted for the MCA and did not lose his/her job in the Great November Purge. This will conclude Miniluv’s re-education of the Senate, thereby leaving approximately 200 Inner Party Members of the House remaining to be re-educated. Our book reserves will be depleted fullwise…therefore we need your copies of 1984 right away! About two hundred copies will complete our mission. Meanwhile, did you know about the Warner Act? And he’s running for President. Now on your telescreen: the Ministry of Love video! Go behind the scenes with actual agents from the Ministry of Love as they prepare a book mailing! Washington, DC, Jan. 17, 2007– U.S. Judge Deborah Robinson dismissed the government’s case against all 16 defendants today charged with “interfering with agency functions.” The 16 had attempted to present a “People’s Signing Statement” opposing the Military Commissions Act (MCA) of 2006 to President Bush at the White House on Oct. 17, 2006. That morning, Bush ceremoniously signed into law the act defendants said legalizes torture for the first time in our nation’s history and broadly denies Habeas Corpus protection — a right guaranteed ever since the Magna Carta of 1215. The charge carried a maximum penalty of six months in jail, a fine of an unknown amount, plus court costs. We have received a promise of 30 new books from Comrade Longsine of Montana, coincidentally the home state of a certain senator whose name escapes our memory at the moment. Miller, Naples, Parks, Puttkammer, and Setzer. We are also grateful to Shakespeare & Company who will be supplying the books. Once received, this donation will bring our collection total to 116, or 37% of our goal! A glorious victory: the Ministry of Love has recently shipped copies of the book to several dozen unpersons. Video of this historic event will be posted shortly. Today, we are indebted to Comrade Paglino of Ohio and Comrade Loftis of New York, who have brought our collection total to 86 books. This represents 27% of our goal! In other news, we wish to share with you photographs of actual members of the Ministry of Love, who recently emerged from their underground headquarters to mourn the passing of the United States Constitution. 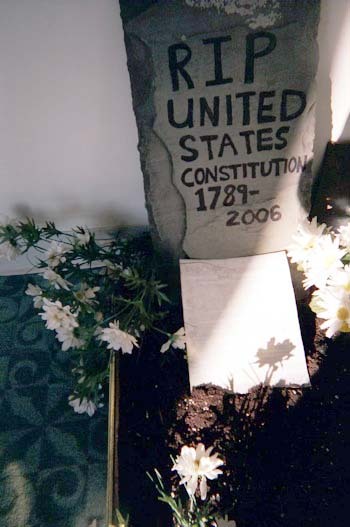 Here you see the gravesite where the Constitution was laid to its eternal rest. 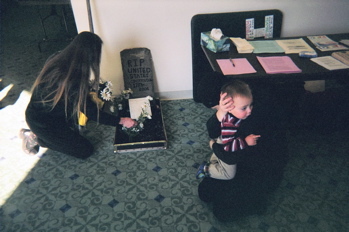 Mourners gather to pay their respects to the document. This small child was especially upset. 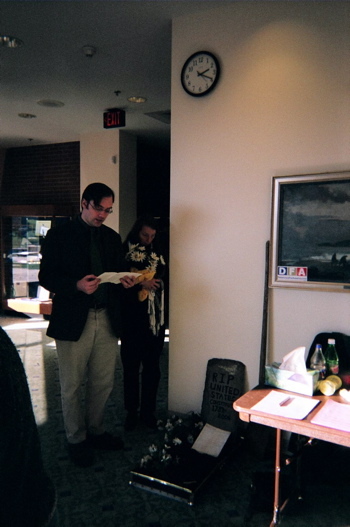 Finally, Comrade Cobb reads the eulogy. 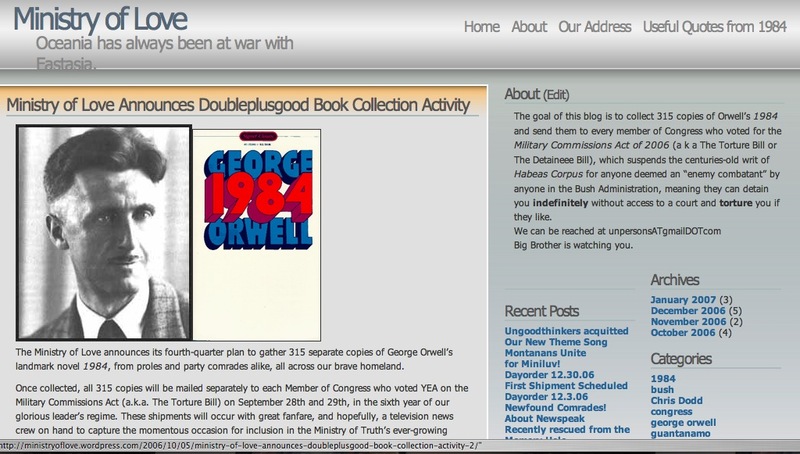 The goal of this blog is to collect 315 copies of Orwell’s 1984 and send them to every member of Congress who voted for the Military Commissions Act of 2006 (a k a The Torture Bill or The Detaineee Bill), which suspends the centuries-old writ of Habeas Corpus for anyone deemed an “enemy combatant” by George W. Bush, meaning his administration can detain you indefinitely without access to a court and torture you if they like. Miniluv seeks your contributions for postage to the Inner Party Members. Send your funds to unpersons*gmail . com.